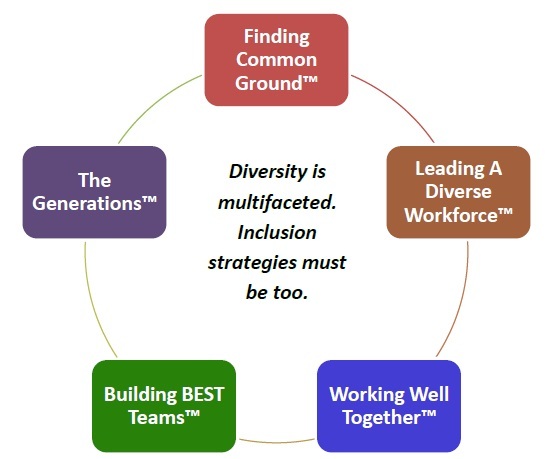 The Diversity at Work Series™ consists of five (5) different workshops designed to help leaders and organizations leverage the power of diversity in their workforce. For any initiative to be successful there must be buy-in and commitment from leaders and influencers within the organization. Finding Common Ground™ explores the business case, fosters understanding and clarifies why effectively managing diversity in the workplace will help the organization achieve its mission. Since leadership is a key ingredient to organizational success, starting at the head, with leadership, is critical to success. Leading A Diverse Workforce™ is designed for leaders, both formal and informal, to assess and build skills for leading and managing a diverse workforce. This module will arm leaders with practical strategies for increasing engagement and productivity. Leading A Diverse Workforce™ is now offered at Southwest Tennessee Community College Macon Campus in Memphis, TN. Click the register button and scroll down the page ﻿to find the course title and date. Contact Coach Gwen to bring this seminar to your organization. For diversity and inclusion efforts to work, all employees must be aware of what diversity is, why leveraging diversity is important to business success and their part in making diversity work. Highly productive teams must be built. It does not happen by accident. Its intentional. Building BEST Teams™ helps a group of individuals understand the stages of group development, assess their current state and develop skills to move from forming to performing. Armed with an individual action plan, each group member can take 100% responsibility fortheir part in helping the group become a high performing team. From a generational perspective, the workforce is more diverse than ever. This fact makes for a highly dynamic environment potentially laced with collisions and unhealthy conflict. The Generations™ is designed to explore attributes of each generation, not for the purpose of labeling, but for the purpose of understanding how the generations can “blend” to achieve organizational success. So, how are you faring? Are you leveraging the diverse talents of your workforce to realize its highest potential? Or, are you consistently struggling with issues related to employee engagement? If so, the Diversity At Work Series has a solution to address issues related to diversity and inclusion. If you are ready to take action, please contact me. I would love to work with you and your team to increase levels of engagement and productivity.